by Chris Woodford. Last updated: November 27, 2018. Remember a time when you blew up a balloon, held it a moment, then let it zoom madly round the room? What seemed like a great big, goofy old joke back then was really a basic lesson in pneumatics—putting pressurized air to practical use. From factory machines and road drills to paint-spraying robots and power tools, all kinds of everyday things rely on pneumatics. It sounds like a huge contradiction: how can something as useless and empty as air do such wonderfully useful things? How can you lift a helicopter, drill a hole, or power a train with just a big old bag of nothing? It's all down to the simple science of pressure and the way gases store energy when you squash them up. Let's take a closer look! Photo: Pneumatics is used in some ingenious machines. 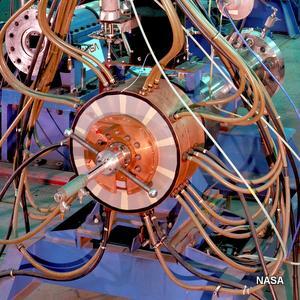 Here's a pneumatic cylinder with air hoses attached, forming part of a NASA electric arc shock tube, which is used to carry out tests on space-vehicle reentry. Photo courtesy of NASA on the Commons. Pneumatics is the science and technology of pressurized air—using piped, compressed air (or a similar gas, such as nitrogen) to transmit force and energy. 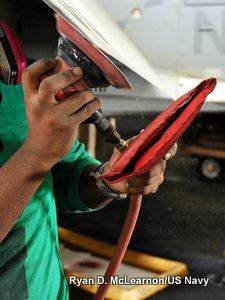 So a pneumatic drill (or jackhammer) can blast the pavement apart with a metal chisel pumped up and down by compressed air feeding in from a hose, while a robot paint machine uses compressed air to make an even spray across something like a car body. As we'll see shortly, pneumatics is similar to hydraulics, where we use water (or another liquid) to transmit force and energy in something like a bulldozer or a crane; both are examples of fluid power, but where hydraulics uses liquid, pneumatics uses gas. Photo: Pneumatic machines, like this hammer drill, are powered by hoses that deliver energy and force in the form of pressurized (compressed) air. Photo by US Bureau of Reclamation courtesy of US Library of Congress. Think back to that balloon you blew up and let go. You used your lungs to blow air inside it. Each breath you forced inside inflated the balloon a little bit more, pushing outward with some force against the air pressure and the stretchiness (elasticity) of the rubber pushing in from outside. So, in physics terms, you used a force (your breath) over a distance (the amount you inflated the balloon): you did what scientists call work on the balloon. You compressed the air and forced it into the balloon under pressure. Now compressing a gas stores energy in it. It takes energy to do the work that squeezes a gas, and the energy you use isn't wasted—it's stored in the compressed gas as potential energy you can use later. In other words, inflating a balloon is a bit like filling up a small energy tank (or reservoir) made of rubber. When you let go of the balloon, the trapped gas is released: it expands, so its stored potential energy rapidly turns back to kinetic energy, making a jet of air that powers the balloon round the room—a very simple kind of jet engine. Photo: Pneumatic? 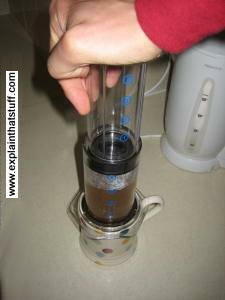 An Aeropress coffee maker is like a big plastic syringe that uses air pressure to push hot water through coffee. It has some of the components of a pneumatic machine, but not all of them. Some people prefer to define pneumatics more widely, so it covers pretty much any technology that uses moving air. Such a broad definition can take in everything from vacuum cleaners (which use suction) to jet engines—even Aeropress coffee machines—but I find it more vague and less useful. With a jet engine, for example, just like with a balloon, the rush of gas shooting back through the exhaust nozzle powers the plane forward, but another part of how a jet engine works is combustion (getting energy out of burning fuel) and the "air" flowing through it doesn't really do the same job, in quite the same way. A truly pneumatic plane would have something like a giant tank full of compressed air in the wing (a balloon-like reservoir) feeding through a hose to a turbine or a propeller, and driving the plane forward that way; there wouldn't be any combustion going on. So, just to be clear before we start, this article is based on a tighter definition of pneumatics—with the focus on using compressed air to transmit forces and store or carry energy—and the examples I use will tend to reflect that. It won't cover jet engines, vacuum cleaners, hovercraft, and other air-moving technologies that rely less directly on piped, compressed air (you can find my articles about those things by following the links). How do pneumatic machines work? A reservoir (or receiver)—stores air. One or more valves—control air. A circuit—moves air between the other components. An actuator or motor—uses air to do something. Pneumatic devices get all their power from the energy in the compressed air they use, so you can probably see straight away that they need at least two key components: something to compress the air (the compressor) and something that uses compressed air to lift, move, or hold an object (the actuator). We also need a pipe or network of pipes (the circuit) to get air from the compressor to the actuator. Something to switch the air on or off (a valve) and maybe reverse its direction would also be handy (so we can make our machine lower things as well as lift them). There's one more thing we need in a pneumatic system. Since air is a very compressible gas, a basic system linking a compressor to an actuator through a circuit and a valve would work very slowly. When you switched it on, it would take time for the compressor to push air through the circuit and build up enough pressure to make the actuator move (just like it takes some time for a bicycle tire or a balloon to really start inflating as you wait for the pressure to build). So a pneumatic machine also has a reservoir (a balloon, in effect) where quite a bit of compressed air is stored under pressure, ready to deliver near-instant force as soon as the operating valve is opened. Animation: How pneumatics works (in theory). Here you can see the five key components of a pneumatic machine: 1) Compressor (red); 2) Reservoir (blue); 3) Valve (orange); 4) Circuit of pipes (gray); 5) Actuator (green). The yellow line shows the flow of compressed air. In this case, the actuator is a simple pneumatic cylinder and a piston that goes up when the valve flips up, allowing air into the bottom of the cylinder; it goes down when the valve flips down, so air flows into the top of the cylinder. For the sake of simplicity, I've missed out some of the details, including the cylinder's exhaust (outlet) valves and the engine that powers the compressor. Photo: How pneumatics works (in practice). 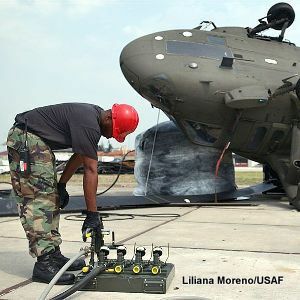 Here an airman is lifting an overturned helicopter with the help of a giant pneumatic airbag (light gray). The setup here is much like it is in the animation, though you can see only three of the key pneumatic components (the circuit of pipes, the valves controlling them, and the actuator bag that lifts the helicopter); you can't see the compressor or reservoir. Photo by Liliana Moreno courtesy of US Air Force. The compressor is the machine that turns ordinary air into compressed air, squeezing it to around 7–10 times atmospheric pressure (in scientific units, 7–10 atmospheres, 700–1000 kPa, or 100–150 psi); to give you a rough idea, that's about 25–30 percent more pressure than in a champagne bottle or 2–3 times the pressure in a car tire. That's quite a bit of pressure but nothing too extraordinary, and it tells us that we're going to need quite a lot of compressed air to do anything really useful. The compressor is the starting point for any pneumatic circuit: it's the bit that puts energy into the system by squeezing air into a much smaller space. Now it's important to note that air isn't like the fuel you load into a gasoline engine: it doesn't contain much useful energy to begin with. Squeezing energy into ordinary air is the job that the compressor does, although it doesn't actually "make" this energy out of nothing. Typically, it's powered by a gasoline or diesel engine, so it's simply converting energy from one form to another—burning gas or diesel from its tank, in an engine, and so converting the energy stored in that fuel into energy stored in pressurized air. I have a separate article about compressors and pumps and you can read more about them there. "Actuator" is a bit of engineering jargon that just means "mover"; it's the business end of a pneumatic tool; the bit that shifts about and does some useful job for us. It might be a pneumatic drill bit thumped up and down by a piston, a factory ramp that lifts things and lowers them, a mechanical arm that swings things around, or something like that. Actuators typically move back and forth in a straight line (the technical word for that is reciprocate) and, as in the animation above, they're often powered by pistons that slide back and forth in cylinders as compressed air flows in and out of them. They turn the potential energy stored in compressed air back into kinetic energy and movement. What if we want a tool that spins around (rotating) instead of just moving back and forth (reciprocating)? Then we can use an air-powered motor, in which moving gas makes a shaft rotate. It works in a similar way to a turbine, which is a machine powered by a kind of internal windmill. As gas flows through an air motor, it pushes against vanes and makes an axle spin around, turning a drill bit or something like that. 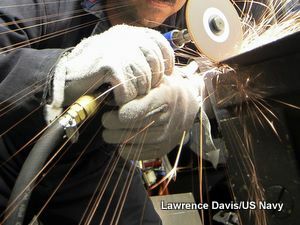 Pneumatic tools like grinders, polishers, and dentist drills work this way. Photo: Pneumatic machines like this grinder use air motors to produce high-speed, powerful rotary force. How do we know it's not electric? The giveaway, as always, is the thick gray air hose leading to the machine (bottom left). Photo by Lawrence Davis courtesy of US Navy. Although some pneumatic machines might have a single compressor, actuator, valve, and reservoir, most are more complex than this. There are many kinds of actuators and valves, and a factory might have all kinds of machines driven from a complex circuit by a single, large compressor. You can make complex electronic circuits from different arrangements of the same basic components, and you can make complex pneumatic circuits in exactly the same way. There are dozens of little pneumatic symbols to help you draw circuits out clearly on engineering plans, just as there are symbols for electronic and hydraulic	components. Taking things a step further, it's possible to make very advanced logic circuits entirely from fluid-powered components; an entire field of engineering called fluidics (fluid logic) is devoted to this. Just as electronic components like resistors, capacitors, and transistors can control complex devices by making electricity flow in different ways round circuits, so fluidic components can do equivalent things by changing the flow of air around analogous components. There are fluid equivalents of AND/OR logic gates, timer circuits, latching units, switches, and amplifiers, for example. 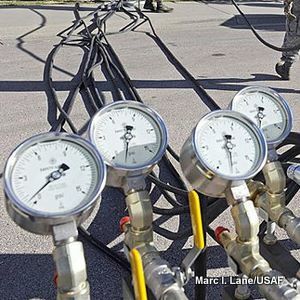 Photo: Maintaining steady air pressure is the key to pneumatics; most pneumatic tools and machines have pressure gauges on them somewhere, which help to identify leaks. Photo by Marc I. Lane courtesy of US Air Force. What can we use pneumatics for? Put these basic components together in different ways and you can make many different machines to do many different jobs. Things you might do with an electric motor or a hydraulic machine can be done just as well (or better) with a pneumatic machine (we'll come to why you might use one of these technologies rather than another in a moment). Air-powered tools are probably the most familiar, everyday example of pneumatic technology (whenever I hear the word "pneumatic," the next word that leaps into my head is invariably "drill.") Using either a piston-cylinder actuator or an air-powered motor, virtually any kind of construction tool can be powered by compressed air, from screwdrivers and hammers to wrenches, polishers, and piledrivers. Photo: Pneumatic power tools, like this sander, are lightweight and easy to use. Photo by Ryan D. McLearnon courtesy of US Navy. In the world of industry, factory machines are a much more widespread and perhaps interesting application of pneumatics. When we think of robots, we usually think of electronic circuits making arms move using things like stepper motors (electric motors that turn through precise amounts, one step at a time), but they're just as likely to use hydraulics and pneumatics—as well, or instead. Computer-controlled robots might be holding pneumatic paint-sprayers, for example, or hydraulic cutting tools. Pneumatic factory machines are widely used to pick up and place objects using suction to hold things or squeeze them very gently, then release them some time later. Robotic cow-milking machines that automatically attach and release suction cups to an animal's udders are a clever variation on this pneumatic theme, and they illustrate an important advantage of pneumatics: it can apply force very gently. Pneumatic devices and machines are also widely used in transportation—and in quite a range of different ways. Since the 19th century, pneumatic transport tube technology, has been widely used by banks, hospitals, and even hamburger restaurants to move things swiftly and securely down networks of air tubes from one part of a building to another. The 21st-century's answer to Thomas Edison, electric car pioneer and prominent inventor Elon Musk, has garnered lots of publicity for an idea he calls Hyperloop, a high-speed railroad running inside a giant, closed tube. Although it sounds similar to an ordinary pneumatic tube system, it's radically different: the passenger cars zip through the low-pressure tubes propelled by linear motors rather than compressed air. In pneumatic tube transportation, compressed air makes things move, but in other systems, it can also bring things rapidly to a halt: for example, it powers the air brakes in large vehicles such as trucks and railroad engines and exploding automobile airbags (though they're not really pneumatic, according to my strict definition). Pneumatics might seem humdrum and dull, but it has entertaining applications too. How about player pianos and pipe organs; exercise machines where the resistance comes from pneumatic pistons; and even bouncy castles? Nothing dull about any of those things! As we've already seen, pneumatics and hydraulics use fluids to move force and energy through simple (and not so simple) machines. Both are well suited to making machines move back and forth (reciprocal motion) and can operate at considerable distances from their compressor or pump without any need for things like conveyor belts or gears. Both can achieve considerable power with relatively lightweight machines (that's one reason why dentists sometimes use pneumatic tooth drills, which are extremely powerful but very light). If both types of fluid power do similar jobs, why would you use a pneumatic machine instead of a hydraulic one, or use either of these in place of something electric? There are all sorts of different considerations to weigh up. For medium-power, high-speed, applications where accuracy isn't critical, and soft action or cushioning (force absorbing) are important, pneumatic systems are often preferred to hydraulic ones. Hydraulics tends to win for high power, high accuracy, high-force transmitting applications, and any application where variations in air temperature or pressure might cause problems for a pneumatic system. But hydraulic machines do tend to move slowly. 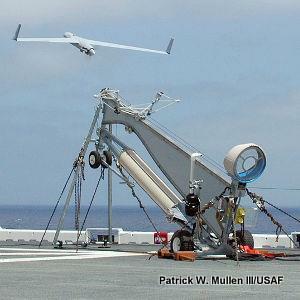 Photo: Light and maneuverable, this pneumatic wedge catapult is perfect for launching drones from onboard navy ships. Notice the pneumatic cylinder (the black thing just above the wheels). Photo by Patrick W. Mullen III courtesy of US Navy. Pneumatic machines are generally (but not always) less responsive and less accurate than hydraulic ones, largely due to the compressibility and relative unpredictability of air. They're less efficient and more expensive to run, because it takes a relatively large amount of electrical energy to run a compressor and store some of that energy in compressed air—and a fair bit of that energy is wasted when the spent gas is released as exhaust. Electric motors are relatively heavy, spinning things, so they have a high moment of inertia—a kind of flywheel effect—that makes them relatively slow to start and stop. That means they take time to supply maximum force and time to stop or reverse. Fluid-controlled machines, on the other hand, have relatively little momentum, so they can (generally) be started, stopped, and reversed more quickly. Pneumatic tools use lower pressures and smaller forces, so they tend to be lighter and more compact, which can be extremely important in the case of things like hand tools. Pneumatic tools might be made of relatively light plastic, where hydraulic ones have to be made from metals to cope with higher forces and pressures. Unlike electric motors, pneumatic and hydraulic machines don't use any electricity at the point where work is being done, so there's less risk of a spark or gas explosion (a very important consideration in places like underground mines). Also, unlike electric motors, both are self-cooling (their fluids disperse heat), and there is no chance of overheating or electrical burn out. Fluid leakage is a potential problem in both hydraulic and pneumatic systems. While pneumatic tools and machines invariably exhaust their working gas to the air once it's expanded and done its job, hydraulic ones are sealed units designed to keep the same fluid recirculating. Since hydraulic fluid is flammable, pneumatic systems are inherently much safer than hydraulic ones in dangerously explosive environments. Since hydraulic machines use oil, they are self-lubricating and often much quieter than pneumatic tools (which don't self lubricate). The compressors and exhausts of pneumatic tools can be especially noisy, though silencers can be fitted. So that's a basic overview of pneumatics—a technology that handles everything from balloon-powered toys to air-driven drills. Next time you see someone using a power tool or machine, take a closer look and see if you can figure out whether it's electric, hydraulic, or pneumatic. Can you figure it out from the size of the force the machine is likely to need? (A bigger machine, like a crane or bulldozer, is much more likely to be hydraulic.) Is the speed of the machine something of a giveaway? (Pneumatic machines tend to be faster than hydraulic ones.) Is it the kind of thing that needs the gentle touch of pneumatics (like a cow-milking, machine)? Is it noisy—is that the bang of a pneumatic exhaust you can hear and the drone of an air compressor in the background? Do safety considerations (for example, working underground or with explosive natural gas) make it more likely for the machine to be pneumatic than electric? Is the power line too thin for a pneumatic air hose and too flexible to be hydraulic (making it more likely to be electric?)? If you're an engineering geek, you can have a little bit of fun playing pneumatic eye-spy! Artwork: A milestone in pneumatic history. George Westinghouse's railroad brake from his 1869 patent. The compressor (orange, right) powered by steam from the locomotive, fills a reservoir (blue, left) with compressed air. When the brakes need to go on, this feeds pressurized air through the yellow hose to the brake cylinder (red), shifting a piston back and forth, applying the brake shoes (purple) to the wheels (green) or releasing them. From US Patent 88,929: Steam power brake by George Westinghouse, April 13, 1869, courtesy of US Patent and Trademark Office. ~2000BCE: The pot bellows is invented to help people make fire more efficiently. It's a pot with a leather skin stretched over it like a flexible lid. You pump up and down on the skin to direct a powerful draft of air (and oxygen) into a fire. ~350BCE? : Aristotle (384–382BCE) coins the physics principle "nature abhors a vacuum," which is a (very indirect) way of saying that air pressure is powerful and useful. The Ancient Greeks also give us the word pneumatic (their word "pneumatikos"), meaning air-powered. ~50CE? : Hero of Alexandria (10–70CE) develops a number of basic machines powered by moving steam or air, including a simple spinning steam engine (the aeolipile) and a wind-powered organ. Middle Ages: Leather bellows are invented; originally for blacksmiths, they're later used as a source of pneumatic power in things like organs. 1654: German physicist Otto von Guericke (1602–1686) develops the vacuum pump. Famously, he demonstrates its power by pumping the air from in between two huge hemispheres. Atmospheric air pressure clamps the spheres together so firmly that teams of horses cannot pull them apart. ~1799: Scottish engineer William Murdoch (1754–1839) first proposes the idea of pneumatic tube transport. 1799: British engineer George Medhurst (1759–1827) proposes an early pneumatic ("atmospheric") railway powered by air pressure instead of steam, including the idea of using compressed air to power a motor (a device he calls an aeolian engine). In 1847, Mechanics Magazine summarizes his idea as "a new method of driving carriages of all kinds without the use of horses, by means of an improved aeolian engine, and which engine may also be applied to various other useful purposes (the power applied to the machinery being compressed air, and the power to compress the air being generally obtained by wind, etc." 1865: British inventor George Law (about whom little seems to be known) develops the pneumatic rock drill, in which compressed air pumping a piston bangs a hammer into the ground. The following year, a four-cylinder drill is used to dig the Hoosac tunnel in Massachusetts, USA. 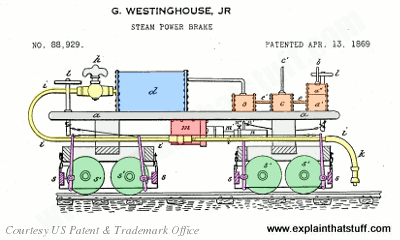 1869: US industrial engineer George Westinghouse (1846–1914) is granted a patent for a pneumatic steam railroad brake. 1879: While developing better methods for carrying cash around buildings, US inventor William Stickney Lamson revives William Murdoch's pneumatic tube transport idea, now widely known as the Lamson tube. 1960s: Fluidic (fluid-logic) machinery first starts to become popular. 2013: US inventor Elon Musk proposes Hyperloop, a mass-transit people carrier based on giant pneumatic tubes, not unlike Lamson tubes. Practical Pneumatics by Chris Stacey. Routledge, 1998/2015. A very comprehensive introduction that covers both the theory of compressed air and the practice of pneumatics, including components, circuits, and real-world applications. Hydraulics and Pneumatics: A Technician's and Engineer's Guide by Andrew Parr. Butterworth-Heinemann, 1998 (reprinted 2013). Air Tools: How To Choose, Use And Maintain Them by Rick Peters. Stirling, 2000. 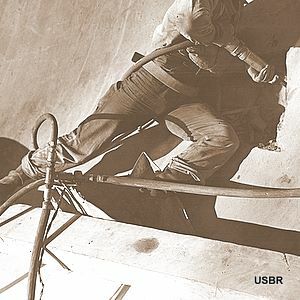 A 128-page overview of handheld pneumatic tools (spray guns, sanders, drills, and so on). Can You Feel the Force? by Richard Hammond. Dorling Kindersley, 2007/2015. A basic introduction to physics, and the bedrock concepts you'll need to understand tools and machines of various kinds. Amazing Models! Balloon Power by Peter Holland. TAB Books, 1989. Balloon power is probably the best way to introduce younger kids to pneumatics and it's relatively easy to build cars and bathtub boats that work in that way. This old book is unfortunately the only one I've managed to track down. No longer in print, but easy to find secondhand. Pneumatics basics by WidgetWerks. What does pneumatic gear actually look like? This simple introduction runs through examples of a few different actuators and valves. Pneumatics AND/OR logic by dgscdt. A very quick demonstration of how pneumatic valves can be used to make AND/OR logic gates. Pneumatic Generator Could Make Soft Robots Useful by Evan Ackerman. IEEE Spectrum, October 15, 2015. Pneumatic robots need lots of compressed air; could they make it themselves out of water? Deflating the Air Car by Peter Fairley. Popular Science, October 30, 2009. Could environmentally friendly cars really run on compressed air? Jet-smooth ride for new small Austin by David Scott. Popular Science, August 1973. A great article from the archives about the introduction of "Hydragas" pneumatic suspension in the early 1970s.